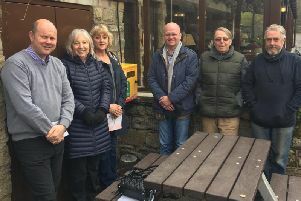 Calderdale Council is stepping up the fight against fly-tippers and appealing for residents to help catch the culprits. It comes after the Council cleared 60 illegally dumped tyres and four tonnes of rubbish and rubble from a track in Shelf last week following concerns raised by local people. Furniture, carpets, dozens of bricks, large pieces of wood and household waste were just some of the items abandoned along Halifax Road – the main road between Halifax and Bradford – on the track between Carr House Road and Carr House Lane, Shelf. Members of the Council’s Safer, Cleaner, Greener team set to work removing the waste; there was so much that they had to use a tractor. The track is now clean again and the Council has put in a new barrier to try to prevent further fly-tipping. Deputy council leader Coun Barry Collins (Lab, Illingworth and Mixenden), said: “Most people throw their rubbish away properly, but it’s appalling that some people think they can blight our landscape and use other people’s land as a dumping ground. Not only is it illegal – last year we successfully brought five prosecutions through the courts with fines up to £1,000 each – it can also be harmful to people and wildlife, is extremely unsightly and costs Calderdale council tax payers up to £140,000 per year. “In Shelf last week, our teams did a fantastic clean up, and they continue to work hard to keep our borough clean, safe and beautiful. But enough is enough – we need to put a stop to fly-tipping in the first place, and are sending out a clear message that we won’t hesitate to prosecute offenders. “We do all we can to deter and detect fly-tippers but we rely on evidence to successfully prosecute. “Quite often this comes from the people in our communities who see the culprits in action, and we need your help. The Council continues to take action to stop fly-tipping. For example, fences are put up on Council-owned land to deter fly-tippers and suspect premises are investigated to check waste disposal arrangements. There are five household waste recycling sites across the borough where residents can dispose of their waste correctly, and you can ask to have bulky household waste collected at www.calderdale.gov.uk, customer.first@calderdale.gov.uk or on 01422 288002. New legislation introduced in April means the Council can now crack down even more on fly-tipping, with the power to stop, search and seize vehicles suspected of waste crime. The aim is to take more immediate action, hopefully resulting in more prosecutions. You can report fly-tipping through the online form at www.calderdale.gov.uk or by calling the Council confidentially on 01422 288001. If you see someone fly-tipping, never approach them and don’t touch or sort through the waste as it may contain dangerous materials.